110 • October 2014 • S I G N & D I G I T A L G R A P H I C S RUNNING THE BUSINESS and how acceptance and commitment to change will be earned. Action—develop a detailed tactical plan to implement the best practices and monitor progress along the way, and Maturity—recalibrate benchmarks, "hold on to the gains" and assume a lead- ership position as a potential comparison company for another organization wish- ing to use you as their benchmark. 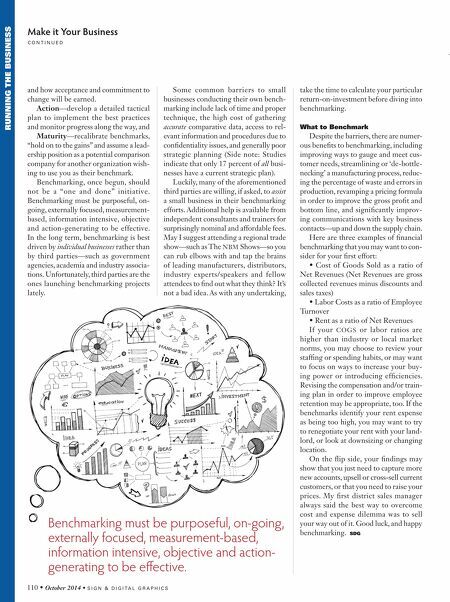 Benchmarking, once begun, should not be a "one and done" initiative. Benchmarking must be purposeful, on- going, externally focused, measurement- based, information intensive, objective and action-generating to be effective. In the long term, benchmarking is best driven by individual businesses rather than by third parties—such as government agencies, academia and industry associa- tions. Unfortunately, third parties are the ones launching benchmarking projects lately. Some common barriers to small businesses conducting their own bench- marking include lack of time and proper technique, the high cost of gathering accurate comparative data, access to rel- evant information and procedures due to confidentiality issues, and generally poor strategic planning (Side note: Studies indicate that only 17 percent of all busi- nesses have a current strategic plan). Luckily, many of the aforementioned third parties are willing, if asked, to assist a small business in their benchmarking efforts. Additional help is available from independent consultants and trainers for surprisingly nominal and affordable fees. May I suggest attending a regional trade show—such as The NBM Shows—so you can rub elbows with and tap the brains of leading manufacturers, distributors, industry experts/speakers and fellow attendees to find out what they think? It's not a bad idea. As with any undertaking, take the time to calculate your particular return-on-investment before diving into benchmarking. 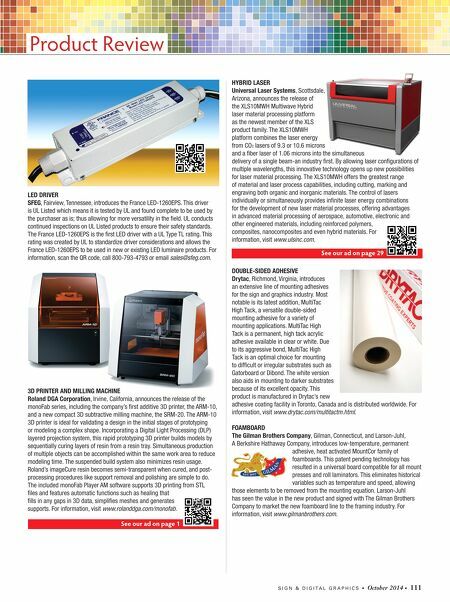 What to Benchmark Despite the barriers, there are numer- ous benefits to benchmarking, including improving ways to gauge and meet cus- tomer needs, streamlining or 'de-bottle- necking' a manufacturing process, reduc- ing the percentage of waste and errors in production, revamping a pricing formula in order to improve the gross profit and bottom line, and significantly improv- ing communications with key business contacts—up and down the supply chain. Here are three examples of financial benchmarking that you may want to con- sider for your first effort: • Cost of Goods Sold as a ratio of Net Revenues (Net Revenues are gross collected revenues minus discounts and sales taxes) • Labor Costs as a ratio of Employee Turnover • Rent as a ratio of Net Revenues If your C O G S or labor ratios are higher than industry or local market norms, you may choose to review your staffing or spending habits, or may want to focus on ways to increase your buy- ing power or introducing efficiencies. Revising the compensation and/or train- ing plan in order to improve employee retention may be appropriate, too. If the benchmarks identify your rent expense as being too high, you may want to try to renegotiate your rent with your land- lord, or look at downsizing or changing location. On the flip side, your findings may show that you just need to capture more new accounts, upsell or cross-sell current customers, or that you need to raise your prices. My first district sales manager always said the best way to overcome cost and expense dilemma was to sell your way out of it. Good luck, and happy benchmarking. SDG Make it Your Business C O N T I N U E D Benchmarking must be purposeful, on-going, externally focused, measurement-based, information intensive, objective and action- generating to be effective.